This post will detail how to remove and install a serpentine belt on a 3.1L or 3.4L GM V6 engine. These engines were found in many models of GM vehicles made from 1998 to 2005, such as the Chevrolet Lumina, Malibu, Venture and Monte Carlo; the Pontiac Grand Am, Grand Prix, Montana, Transport and Aztek; the Buick Century and Rendezvous; and the Oldsmobile Alero and Silhouette. This post develops an efficient way for one person to accomplish the job. Tools: 8mm wrench or socket for batter, a 1/2" to 3/8" socket reducer, 1/2" breaker bar, the longer the better, a piece of pipe that will fit over the breaker bar. 1) Disconnect the battery. 8mm wrench or socket. A must for safety. 2) Fit a 3/8" adapter on a breaker bar into the square opening near the bottom of the tensioner. 3) Lift up on the bar and then insert the end six inches into a piece of pipe. The end of this pipe, being used to help hold the tension off the belt, will rest on the front plastic "shelf" above the radiator. It may be helpful to place a block of wood in there to achieve full release of tension. 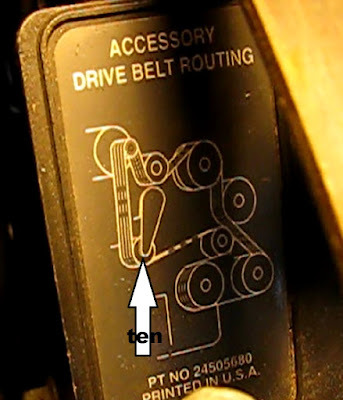 4) Slip the belt off the power steering pump, then the alternator and tensioner. Reach down and remove from the the crank and AC compressor. 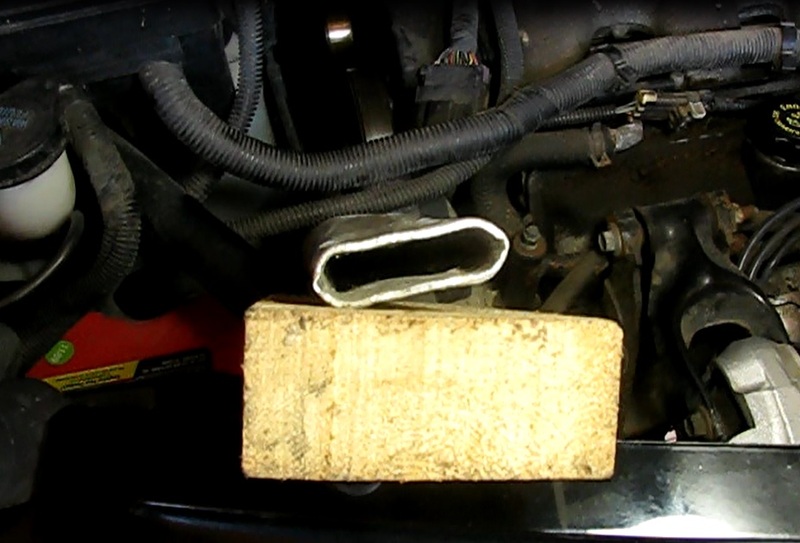 Now slip it out through the gap between the wheel well and front of the engine and under the holding tools. Leave the holding tools in place for installation of the new belt. 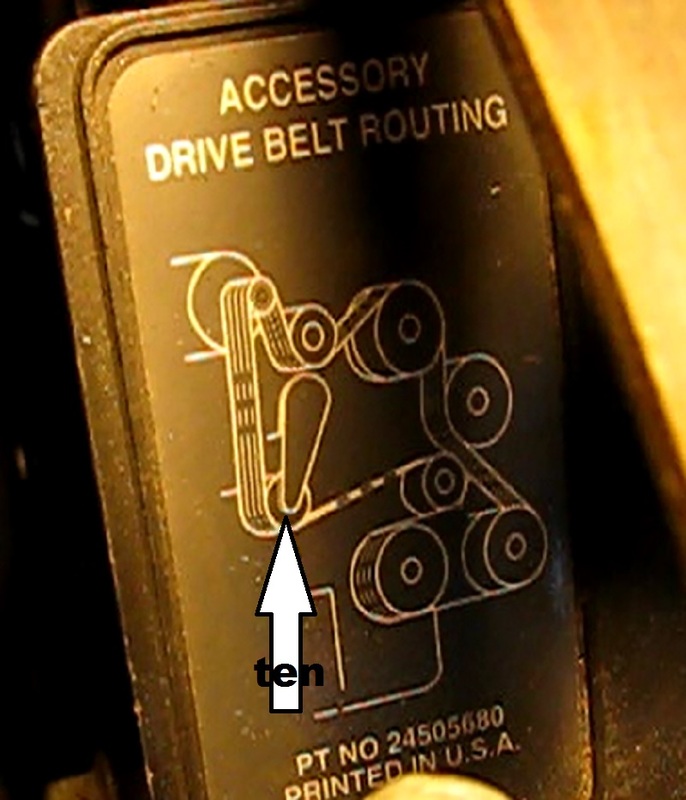 1) Slip the belt under the holding tools and then up and around the tensioner and the alternator. The always helpful routing diagram. Thanks GM. 2) Slip it under the upper idler and make a loop up there between the PS pump and idler. 3) Route it under the crank pulley and AC compressor. 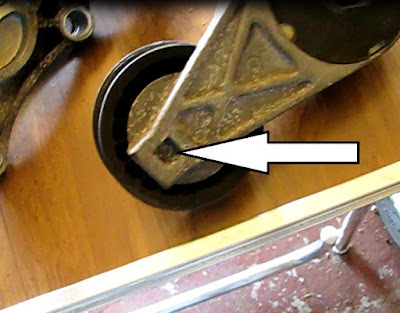 4) Make a loop down there and fit it around the lower idler. 5) Make sure the belt contacts the inside of the water pump. 6) Holding everything in place (this takes both hands), take up the slack in both loops as you slip it over the power steering pump. 8) Hook up the battery.